Getting All High-Tech Here – A Video! Well, at least this is high-tech for me :)! I did a little video tour of my art room for you guys. I shot it with my iPhone so the quality isn’t too bad but it’s rather shaky, Grady says it’s too long, I tripped on the stool, and I rambled on, BUT other than all of that I hope you enjoy it. If you have trouble playing it you can go directly to youtube here and watch it http://youtu.be/7ivrfF2mX7A. Please let me know if you have any problems with viewing it. I also wanted to mention that I’m heading to a painting workshop next week – I’m major excited about it! 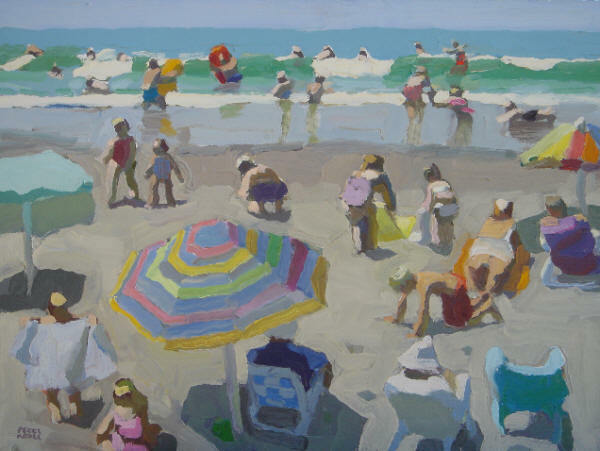 A few months ago I stumbled onto an artist I really like – Peggi Kroll Roberts http://www.krollroberts.com/Gallery%20Peggi%20Kroll-Roberts.htm. She has a very loose style which I love and she’s a great teacher. She has some wonderful DVD’s available http://www.krollroberts.com/DVD’s.htm that I highly recommend for anyone painting in any medium. She really covers some of the fundamentals and gives some great painting exercises. I’ve watched the videos MULTIPLE times (if that tells you anything!). I’m sure I’ll have lots to share from the workshop when I get back! Also, she’s coming here to Nashville to do a workshop in July, if you’re interested check out the information on her website about workshops.